In most cases, mistaken identifications are accidental, rather than a witness’ deliberate attempt to deceive. Witnesses may be compromised by intoxication, fatigue, structural obstructions, light conditions, noise, activity, and unfamiliarity with the crime scene, as well as bias rooted in their own life experiences, suggestion from other people, a desire to be helpful, and a need to feel in control of a frightening situation. Eyewitness identification is further complicated by the way humans store and retrieve memories. Stored memories do not wait passively in a witness’ brain. Memories are altered by the passage of time, the change of emotions, and the witness’ exposure to new information. Clarity can fade quickly, and a desire to please causes many witnesses to “fill in the blanks” with inaccurate information that may ultimately determine the outcome of your case. Many witnesses have a strong desire to gain some measure of control over a frightening event, and the opportunity to help identify a violent criminal presents the perfect vehicle for them to do so. Without meaning to, witnesses will often force a match between their memory and the suspects in pictures or a lineup. Witnesses tend to look for cues from law enforcement to reinforce their identification and may misinterpret verbal and non-verbal signals during an identification session. Over time, many witnesses assume a sense of responsibility and come to think of themselves as partners with law enforcement, which causes them to become more convinced about the accuracy of their identification. Research has shown that people will actively distort or dismiss new information that contradicts their memory. Not wanting to disappoint themselves or others, many witnesses maintain that their identification is accurate, even in the face of substantial evidence to the contrary. 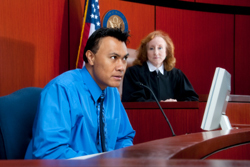 Despite the potential for broad inaccuracy, eyewitness testimony remains an important tool at the center of many of your cases. Therefore, it is in your best interest to partner with an experienced professional investigator to document the crime scene and interview your witnesses. The seasoned investigators at Complete Legal Investigations have the instinct and the “know how” to validate actual crime scene facts, properly position them in light of eyewitness testimony, and increase the validity of suspect identification. We visit the alleged crime scene, take photographs, and provide a rough sketch of the location to you. We are experts at identifying discrepancies or items of interest not reflected in the police reports and discovering the plausibility of victim or witness statements in light of physical evidence. You promise the best for your clients. The experts at Complete Legal Investigations can help you fulfill that promise by clarifying witness observations prior to deposition, assessing witness’ credibility, and uncovering peripheral circumstances from witness contact that may influence your client’s case. Call Complete Legal Investigations today at 561-687-8381.